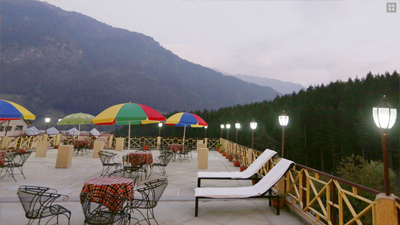 Snow Valley Resort is a 3 star property sets amidst, peaceful and tranquil surroundings. 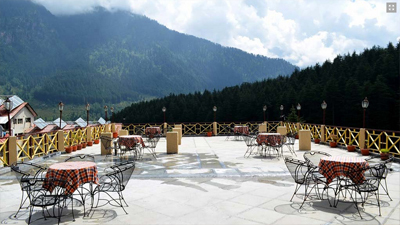 The resort is located at the short distance from various tourist attractions like Tibetan Monastary, Vashist Springs and Manu Temple. The beautiful garden area is a best place to sit back and admire the stunning views of the pinewood trees, apple orchard and snow capped mountains. It offers facilities for both business and leisure travelers for a convenient stay. In free time guests can head to the game room, compress with pool table and other different kinds of playing items for kids as well. Remain in touch with your dear ones using free Wi-Fi service available all over the premises. Rejuvenate your body and mind with special massage service provided at its best. Unwind yourself by shaking legs on hard beats of music while sipping exotic drinks at the on-site discotheque and bar. Look up to your business related work and formal assignments without any interruptions at the well-appointed conference hall/business centre. Guest rooms in the resort are elegantly designed with a comfortable homely ambience. Start your day with freshly prepared breakfast served every morning and on-restaurant is here to satisfy your taste buds with different relishing flavors. Other services such as car rental, doctor on call, private sightseeing, free lodgings for drivers and safety deposit box are also offered here. Relax in the 52 pleasant and cozy rooms featuring stylish décor, wooden furnishing and large windows. These guest rooms are classified into six categories: Standard Room, Luxury Room, Maharaja Room, Presidential Room, SVR Special Duplex and Family Duplex Room. All are fully equipped with modern amenities like LCD TV, telephone, Mini Bar, personal safe, lamps and also offer Wi-Fi. Attached bathrooms come with essential toiletries.